When you think of CMA Fest, a nearly week-long event in Nashville, TN celebrating country music, the Backstreet Boys don’t seem like they’d be likely participants, but that changed in the past week. 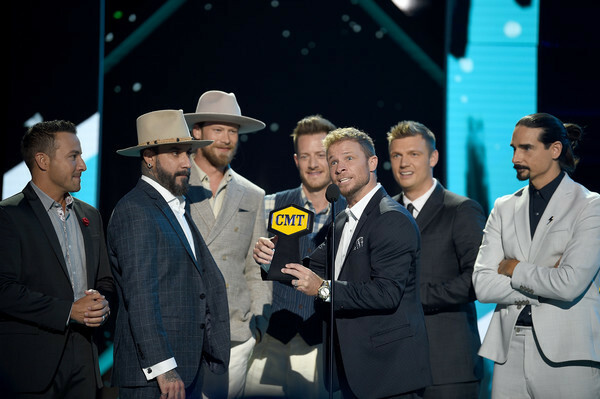 After a stellar performance at Wango Tango in Los Angeles alongside some of today’s biggest artists, Kevin, Brian, Howie, AJ and Nick headed southeast to Nashville, where they not only won their first CMT Award for Performance of The Year with Florida Georgia Line but also made their live television premiere performance of “Don’t Go Breaking My Heart”. See both moments below! Before the Boys took to the stage though, they walked along the “grey carpet”, where they met country superstar Lauren Alaina. The Boys also stopped on the the carpet to chat with Billboard about the new single, explaining “I Want It That Way” to Chrissy Teigen and their favorite BSB music videos then celebrated their win backstage afterward with Entertainment Tonight, where Nick Carter struck a yoga pose and Kevin Richardson discussed manifest destiny. The Backstreet Boys spent the next few days in Nashville celebrating their first #1 on country radio for “God, Your Mama, and Me” at FGL House, recording for their upcoming album, and performing with Florida Georgia Line at Nissan Stadium on Sunday night to close out CMA Week. So does this mean the BSB are going country? Not necessarily - they’re just making music. "We're never being something that we're not, that's the thing," Brian Littrell told Entertainment Tonight. "We're always being us and I hope that people can see that. You know that's all it is. We just love music, we love to be performers and it's blessed our lives tremendously." One thing is for sure - don’t count the Backstreet Boys out of anything.